We Interview Drake White and Chat About His New Band, the Big Changes in His Career and Releasing New Music! 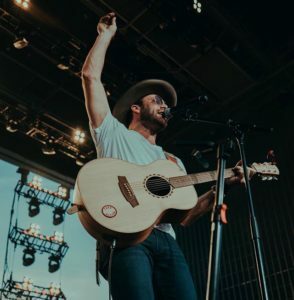 As Drake White prepares to kick off his three-month tour in Springfield, Illinois, on Friday (Feb 8) with his new-look Big Fire band, he found time for an exclusive interview with Six Shooter Country’s Alison Dewar. Drake talked about bonding with his bandmates, working on the next album, and why this year’s C2C Sunday night will be his all-time ever favourite line-up. Plus, there’s the little matter of a couple of impromptu UK gigs he’s hoping to fit in too. Thank you very much for making time to chat with Six Shooter Country today. You have a whole new chapter of your musical life beginning, tell us about it. What’s so cool about this job and profession is that you just keep moving and I love that, from a creative side, I like the newness of everything. Getting out there with new players, new muses and stories, writing new stuff and new songs, that’s what keeps me going – it keeps me fresh. We’re jumping off right now doing our headlining shows in the States and getting our tools sharp for you all in the UK. With the change of band members, it must have been quite tough. What do the new people bring and, even when you’re playing your more familiar songs, is there a new twist to them? Every soul brings different energy to a song, a guitar, a piano or anything. You can play the same song the same way, but two different people playing it means it will be a different song. The Big Fire culture and the Big Fire mentality that we’ve built, these guys that played before us, they are still part of this story. There was no ill will, none of that kind of thing, it’s an evolution of this music and this writing, and it kinda ran its course. The new guys, they bring a fresh energy and a new power, it’s special – it’s like there is even more momentum and power to it. How did you set about bonding them, did you go out and get drunk, did you go hiking in the mountains? (laughs) Yeah, both of those things. It’s important for guys to gel with me from a spiritual side; do you dig the music, dig the spirit, dig the culture of what we are doing. We sat down together, we broke bread, we had a couple of drinks and ultimately you just start playing. You’re having a conversation with the music, and then you kind of look at each other. It’s like having a new girlfriend, you’re trying to figure each other out, and then you’re like ‘oh that works, that’s cool’. There was a lot of preparation before they just came out. I’ve known that there was going to be a change and I gave it to the good Lord up above to make it happen and it just happened, I really didn’t have to work too hard for it. You’re talking to us today having come straight from a writing session. Are you writing on your own, are you collaborating with anyone at the moment and is there a new album in the offing? Nashville has this awesome community, it is just amazing and tapping into that is my muse. I write most days when I’m in town. I’m writing with a bunch of different people, from Jonathan Singleton to a circle of writers, friendships I’ve formed over the years, all kinds of folks. I am writing for a new record, we’re getting a new album together and getting that ready to put out in some capacity. Any clues on how long we’re going to have to wait for that? Shoot, I wish I could tell you. We’re about six songs in right now, a proper album being 12, 13 or 14 songs. I think we’re a little bit over half-finished, we’re wading through the water and getting through it creatively and seeing where it pushes us. Turning to C2C, it’s been two years since you first performed there at Songwriters. You had your UK tour last year, what have fans here got to look forward to this time? It’s about continuing to build the energy. Look at the tree we have already planted, the seed is growing, the tree is growing and the roots are growing. And those roots are fans and memories and stuff like that, so coming back over and seeing all these fans and bringing a new energy and seeing the reactions to these new songs and all these new things, that’s what I’m looking forward to – and the good beer. The people over there have been so good to us, I’m ready to get over there and love all of them. And I would be in trouble if I didn’t ask if you were doing any Meet and Greets? Yeah, we’re going to be doing meet and greets at all the shows. I’ll be out there shaking hands, heck, I’ll be in the middle of the crowd. You’ll see it on my socials and the website when we announce it. I’m committed to getting over there and keep the fire burning. Performing on the main stage with Chris Stapleton, Lyle Lovett, Ashley McBryde – respect, that is the dream team as far as I’m concerned. Oh yeah – and Lyle’s a true Southern gentleman. I’ve been on bills with Willie Nelson and I’ve loved that, but this is artists for artists, note for note, song for song; this is probably my favourite bill ever to be a part of. The O2 is a massive arena, do you think you might slip in one or two smaller, more intimate gigs? I don’t see why I wouldn’t, I just want to play as much as I can while I’m over there, so you’ll just have to see about that. There’ll probably be a couple of impromptu things that we do for sure. Will you get any downtime this year during your visit? I think we will get some downtime. My wife’s not going to let me come over without her coming too, so we’re going to do a little gallivanting around to see what we can see. And that’s just part one of the interview …check back soon for part two, when Drake will be talking more about plans for the new album and why he’s in a ‘very experimental’ creative phase when it comes to new music; interacting with his fans, social media, and who he’d like to enjoy a pie and a pint (or a burger and a beer) with among the music legends. Pingback: Six Shooter Country Hosts Drake White Firestarter Family Gathering at C2C London!